Tomorrow, Saturday, June 7, 2008 my best friend since Elementary School will get married. How many nights and days have we laughed, cried, and wondered where our husbands are???? Just when we thought it was over, here came her prince charming and swept her off her feet. 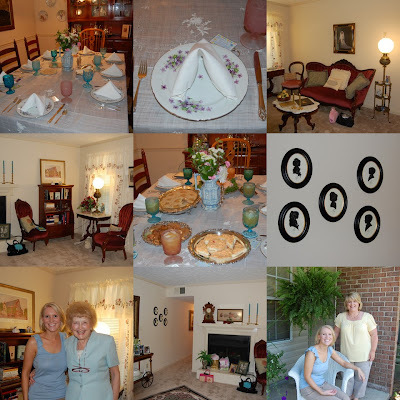 These are some pictures of the Bridal Luncheon we had for her before the big day. I hope to get some good pictures tonight at the rehearsal dinner and tomorrow to post. This sweet lady has watched Carey grow up at their home church and wanted to host the luncheon. She is so sweet and a real fireball! She is a retired teacher and lives alone in an apartment full of antiques and beautiful China! How sweet of Mrs. Marian. Everything looks so pretty. I love girly lunches!